In every document you can find about Cisco’s converged access you will read that with 3650 and 3850 switches access-points need to be directly connected. I understand the reasons why Cisco requires that, but the nerd in me wanted to know how that it works and if the switch can be tricked in the process. 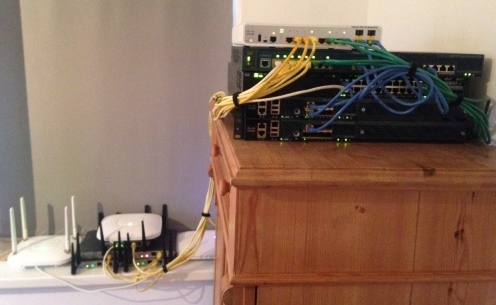 So what happens if you connect an access-point on another layer 2 switch and build a dot1Q trunk between that switch and the 3650/3850? Nov 18 00:58:18.893: %CAPWAP-3-AP_PORT_CFG: AP connected port Gi1/0/24 is not an access port. 3. Only one access-point per interface. Note: I tested this on an 3650 with IOS-XE 03.06.00E, but I do not believe that this is something what will change in newer software versions. CCIE Wireless.. we are still going! I have been quite busy studying for my CCIE Wireless since I started the journey almost nine months ago. Late December last year I passed the latest exam for CCNP and after three attempts I passed for my CCIE Written last month! To give you an idea; I had to put in more that 250 hours of studying after getting my CCNP to get the written; failing with just a few points of is an art I guess. For running WCS / Prime, MSE and ACS I have a VMware server collocated in a datacenter connected with a VPN on a ASA firewall. Some hardware I bought myself (the 3650 for example) and some borrowed from the company lab, which I’m grateful for. The CleanAir technology in Cisco’s access-point’s comes originally from the Cognio acquisition back in 2007. Cognio had a hardware chip that could do spectrum analysis and recognize non wifi interference. After this acquisition Cisco integrated this hardware capability right into its access-point’s. The first access-point with this technology was the 3500 and since then all the 2×00 and 3×00 access-points have CleanAir support. An commonly misunderstanding is that the CleanAir makes an access-points change its channel when it discovers a (strong) non-wifi interference on the channel the access-point is currently on. RRM is the part of the WLC that is responsible for the power and channel configuration of your access-point, not CleanAir. CleanAir only detects. However, when you enable event driven RRM (EDRRM), the RRM algorithm will take the CleanAir information into account. The documentation available today from Cisco on CleanAir Express does not help either. The primary reason for this (which I can think of) is that CleanAir Express has just been implemented since software 8.0, which is still fairly new and the marking people needed something to show earlier than the release of that code. A nice example is this document that states that “Air Qualty Index” is not supported with CleanAir Express, but from my own experience I can tell you that this just does work on 1600 and 1700 AP’s while running 8.0.110 code. See the example below. So what are the big differences between CleanAir and CleanAir Express? Well, from my experiences and from a functional standpoint there are no significant differences anymore since there is finally software which enables CleanAir Express. Because of it architecture CleanAir Express can only track up to three devices per radio (instead of 10) and it is somewhat a little slower, but for me that is now real deal breaker. For the majority of our customers I install Cisco Prime Infrastructure as “enhanced” monitoring tool for the wireless infrastructure. I say “enhanced” because the WLC itself does have a few monitoring features, but all of those are “real time” and not for historical purpose. However, not all the customers need the features that Prime Infrastructure has to offer or they already have some “basic” network monitoring in place. In those cases it is sometimes handy to add the WLC in that monitoring, which is most of the times SNMP based. There is always one question when it comes to SNMP; “what OID do I have to use to get information X?”. I wanted to monitor the total number of associated clients on a particular WLC, but found out that it is very hard to find the right OID for doing so. There is some Cisco documentation about SNMP monitoring on a WLC but thats more “advanced” monitoring. The policy did seem to work but this message was not giving me a warm feeling. So as a typical network engineer of the 21th century, I copied the message into Google in the hope to find out what the poor router was trying to tell me. Literately zero results, so that was very promising. Once you configure class-based queuing on a ISR router, the default interface hold-queue is being changed to 1000 packets. Every class has a default queue-limit of 64, so once you are configuring the 15th class (which is the 16th if you count the default class, which is always there) you should have a hold-queue of 1024 packets (16*64). The hold-queue is 1000 packets so that is the reason why the message is being displayed. So what size should it be? As always it depends, but in consultation with with TAC I configured it to a size of 1984 packets without any problems and with some grow in mind. This was on a 2901 ISR with 50~70Mbit/s traffic placed as a Internet router (so just some basic routing, ACL’s and traffic-shaping). I hope this information can help you! It is almost year 2015 and I was expecting that after 15+ years of wireless 802.11 technology, something like a static “password” for getting secure access to the wireless network is not common anymore. And ofcourse, I was wrong. There are still a lot of devices out there which handle a few (very old) EAP methods or don’t understand dot1X at all. That leaves us with the “pre-shared secret” methods and what if we want to use that at a branch office with a crappy connection to the datacenter / HQ? Cisco’s FlexConnect with “local authentication” to the rescue! The network traffic is being directly bridged to switchport and when the access-point loses the connection to the WLC, clients will be local authenticated. There is a lot of documentation written about the supported EAP methods and how to configure them, but not for a pre-shared key scenario. So I configured it, tested it and it worked like expected. Curious that I’m, I enabled ssh on the access-point and searched for the pre-shared key in the running configuration. It was not there, so where does the access-point stores this information?